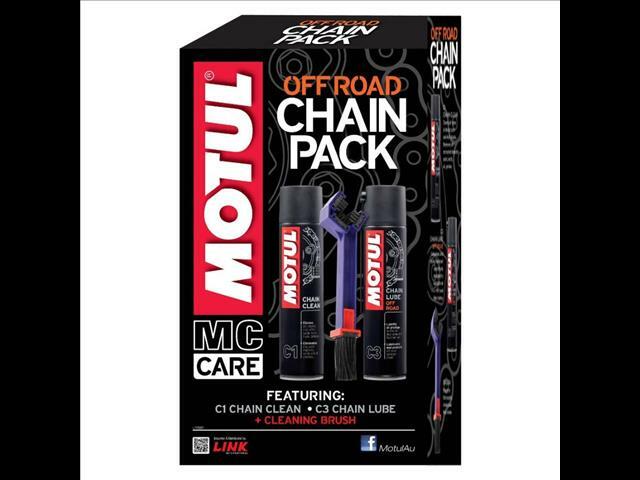 Motul Chain Pack - Off RoadStay on top of your chain maintenance with this great value kit. Includes everything required to keep your chain performing at an optimum level, maximising your chain&apos;s life expectancy. Chain Clean - Cleans all types of motorcycle chains (road and off-road) and quads. Eliminates all encrusted deposits : sand, soil, oil. Chain Lube Off Road - Chain grease specifically for chain lubrication under extreme loads of off-road motorcycles and quads. Ideal for chains with or without o-ring insulation. Cleaning Brush - Dual application cleaning brush.Chain and gear cleaning has never been faster or easier! Scrub the chain with the compact bristles to clean all four sides of a chain. Use the long bristled end to clean excess build up of chain lube off hard to reach areas. Regular component cleaning prevents premature wear and tear on chain and sprockets.